Published on Thursday, July 9, 2015. Come Together: The Rise of Cooperative Art and Design by Francesco Spampinato explores a new generation of artists and makers who are working together, creating inventive work across creative disciplines. Forget the image of the artist as the ultimate soloist, expressing his or her highly individual vision. 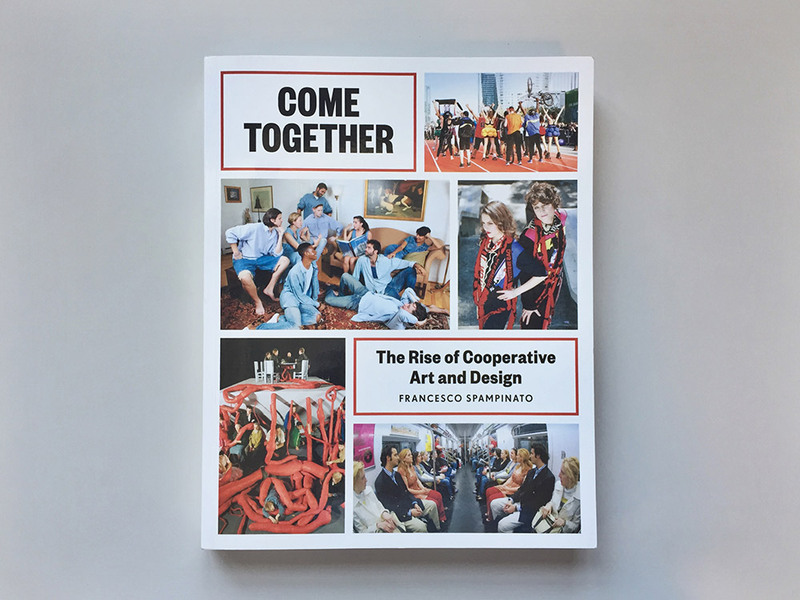 In his new book, Come Together: The Rise of Cooperative Art and Design, Francesco Spampinato explores a new generation of artists and makers who are working together, creating inventive work across creative disciplines. An artist and critic who also teaches at Rhode Island School of Design, Spampinato took time to tell us more about Come Together, published by Princeton Architectural Press. In the book, you profile 40 collectives with terrifically diverse methods and ends – working all around the world. What about their commonalities? What desires or qualities do these collectives share? An aspect these collectives have in common is to transform viewers into producers, making them aware of their potential as agents of change, suggesting [to] them to live their lives actively rather than passively. Most of them work in a very democratic and horizontal way, alternating roles, and sometimes embracing anonymity. Another common element I’m fascinated by is the way they portray themselves: self-portraits are meant both as publicity materials and artworks themselves. But the main feature they share is the very fact of coming together to make art, giving up their individual identities mining the concept of art itself as a solipsistic and exclusive activity. You identify cooperative art and design as a something that's really emerged in the past 20 years. What accounts for its rise? Technology and the internet today allow us to participate, if we want to, in the forms of entertainment we consume, to be informed more transparently or produce consensus democratically. This is not always or yet understood by people, so I like to think that art collectives have this important role of serving as models, facilitating a sense of awareness in people. That’s why their most effective projects are those that invest the public sphere, be it a street performance or an Internet project, because that’s where they can meet and affect a random audience. In this book project, you have a bird's eye view of cooperative practice. Are there any projects you featured that stand out for you? To name one or two representative projects would go against the ethic of the book itself. Most of the activities and projects realized by these collectives are not meant to emerge over others but they are part of larger sets of activities, dots in lines so to speak. However, if there is one thing I’d like to point at, is the methodology of creating networks. Many collectives are based on pre-existing networks or create networks. The idea of networking is a consequence of the need to delegate one’s responsibility as creator, to give up one’s role as author. You interviewed all of these groups (and duos), beginning with a core question: Why work collaboratively? What themes emerged across their answers? Did anyone's response surprise you? I’m particularly satisfied with the results of that specific question because in most cases the duos and groups have used their answers to elaborate a sort of statement or a manifesto regarding their status and their modus operandi. Their answers, however, do not sound pretentious but truly transmit the intentions and desires that brought these people working together. In many cases [it] emerges that “collaboration” is treated itself as a medium. In other words, it is as if they say that it doesn’t matter what the content is but the fact that it is developed collaboratively. What interested you in taking on this project? I’m interested in alternative forms of cultural production, far from the institutions and from the market. The duos and groups featured in Come Together challenge our preconception of what is the role of the artist and mine the status of the art object. They are transdiciplinary and independent from any cultural or market logic. They are involved in ephemeral activities like performance and experimenting with new forms of communication. They often produce multiples, publish books, realize public installations, offer services or facilitate community conversation. Making art collaboratively is definitely not a trend, as many of them state in their answers. If anything, it is a new understanding of art and its potential as a conscience of society and of the art world. Based in New York, Sao Paulo, and Paris, Assume Vivid Astro Focus mixes "graphic elements and symbols from Brazilian Tropicalia and Californian psychedelia," Spampinato writes. This is the group portrait from "Absolutely Venomous Accurately Fallacious (Naturally Delicious)," a sprawling 2008 show that transformed New York's Deitch Projects into a demolition disco. London-based collective LuckyPDF's work "focuses on the power of mass media to create stereotypes," Spampinato writes. This image features Helen Benigson a.k.a. Princess Belsize Dollar (performance) and Samara Scott (set) for a LuckyPDF installation and performance at the 2011 Frieze Art Fair in London.